Hasegawa first released this kit as part of their Creator Works series a few years ago portraying two of the craft that are used in the Last-Exile anime series. 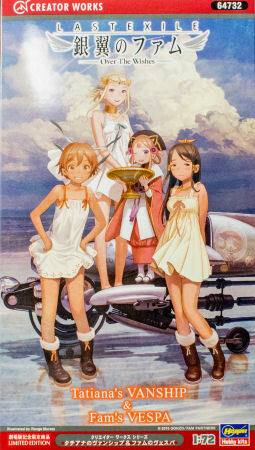 This anime series which also has several mangas published now has a new movie that was released in Japan a few months ago Last Exile - Fam, The Silver Wing, Over the Wishes. Hasegawa released this kit with two resin figures added. 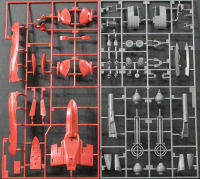 The kit is actually two, a vanship and a vespa, is molded in styrene and presented on four parts trees, one red, one silver-gray, one gray, and one clear. As mentioned above, two resin figures are included in this release providing Fam and Giselle in 1/35 scale. The kit provides markings for two versions of Tatiana's Vanship and two versions of Fam's Vespa. The instructions provide good color references for the figures and vehicles. If you're looking for something different as your next project and you want to enjoy a well-done anime series (doing your research, of course), this Last Exile kit will make for a fun and unusual addition to your model shelf.